Dr. Todoran is currently a Fellow in Cardiovascular Disease in the Division of Cardiology at Washington University School of Medicine in St. Louis, MO. In 2001, he received his MD from Indiana University School of Medicine, Indianapolis, IN. At Duke University, Durham, NC, he completed his Internal Medicine Residency in 2004 and his Cardiovascular Magnetic Resonance Imaging Fellowship in 2005. Dr. Todoran has received the American Society of Nuclear Cardiology Imaging Award and currently has research support from American Society of Nuclear Cardiology Research Foundation. In 2008, Dr. Todoran will begin interventional training at Brigham and Women's Hospital, Harvard Medical School, Boston, MA . Despite current methods of identifying patients with coronary artery atherosclerosis, many individuals suffer cardiovascular events in the absence of established risk factors. Thus, current diagnostic paradigms for the detection of coronary artery atherosclerosis are inadequate. Consequently, there is an impetus to develop improved noninvasive imaging modalities to better detect coronary artery disease (CAD) and determine the prognosis of future cardiovascular events. Cardiac computed tomography (CT) has the capacity to directly visualize the coronary arteries. Cardiac CT can be performed to detect coronary artery stenoses and assess nonobstructive stages of coronary atherosclerosis either through calcium measurement or the analysis of calcified and noncalcified plaque. 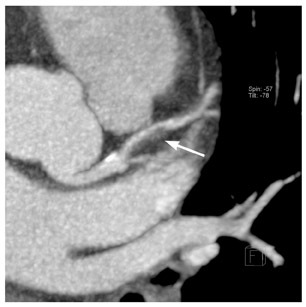 There are some clinical recommendations for the use of coronary CT angiography (CTA) for symptomatic patients, as well as for the use of coronary artery calcium (CAC) measurement in patients who are asymptomatic but are at intermediate risk for CAD events based on the Framingham risk assessment. There are currently no clinical indications for coronary CTA in asymptomatic individuals for stenosis detection or assessment of coronary artery plaque. Current diagnostic paradigms are failing to adequately identify asymptomatic individuals with subclincal CAD. Additionally, the work-up of symptomatic individuals is frequently cumbersome, requiring multiple tests. 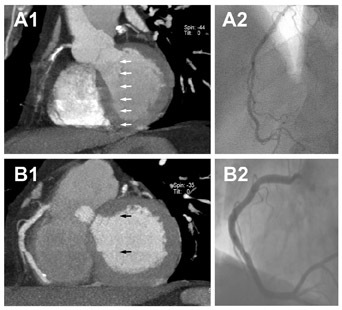 Consequently, a need exists for better diagnostic paradigms for the detection of CAD. One way the current approach can be improved is by the use of noninvasive imaging modalities that, ideally, can be applied to both asymptomatic and symptomatic persons. There are two issues, however. First, subclinical atherosclerosis must be detected among asymptomatic individuals earlier for the purpose of risk stratification. Second, the approach needs to identify symptomatic individuals with CAD efficiently, and more importantly, identify those with flow-limiting disease in whom the treatment paradigms differ from those with non- flow-limiting disease. With the exception of cardiac CT, no single noninvasive imaging technology currently detects both subclinical atherosclerosis and flow-limiting CAD. As such, cardiac CT coronary artery calcium (CAC) detection and coronary CT angiography (CTA) are well positioned to identify these 2 groups of individuals. Greater X-ray tube currents allow for thinner collimation and thinner slice reconstruction, resulting in improved spatial resolution. Faster gantry rotation time, as high as 330 msec for dual-source CT (DSCT), has resulted in an improved temporal resolution of 83 msec. Finally, a higher number of detector rows have led to shorter overall acquisition time, as short as 5 to 8 seconds with 64-slice CT and 1.5 sec with 256slice CT. These shorter acquisition times also make it possible to obtain images with a smaller volume of contrast. All of these advancements have led to significantly improved resolution and the reduction of image artifacts. Little data and no current recommendations exist regarding the use of coronary CTA in the assessment of occult CAD. Therefore, this section will focus on CAC detection. The presence of calcium in the coronary arteries occurs almost exclusively in the context of atherosclerotic changes. Thus, CAC has become a surrogate marker for coronary artery atherosclerotic plaque. 3 Detection of latent CAD in asymptomatic individuals is important since many individuals suffer cardiovascular events in the absence of established risk factors. 1 Cardiac CT can accurately detect and quantify CAC, allowing for noninvasive assessment of subclinical coronary artery atherosclerosis. As a result, CAC measurement has been proposed as a way to improve risk assessment compared with the use of traditional risk factors. Coronary artery calcium increases with age 5 and differs based on gender and race. 6-10 Additionally, age- and gender-adjusted CAC scores have been shown to be more predictive of cardiovascular events than an absolute CAC score. 11 Several studies have found that CAC scoring provides prognostic information either alone or in combination with traditional risk factors. A recent metaanalysis reported a summary relative risk ratio of 4:3 for any measurable CAC, suggesting that a person with measurable CAC is 4 times more likely to have a cardiovascular event than an individual with a CAC score of 0. 12 Furthermore, studies have shown an incremental relationship where higher CAC scores are associated with higher relative risk ratios for cardiovascular events, and more recently, independent prediction of outcomes beyond traditional risk factors or Framingham Risk Score (FRS). 13-20 Additionally, CAC scoring has been shown to predict all-cause mortality more accurately than risk factors alone. A recent large observational study that evaluated long-term prognosis reported an age- and risk-factor-adjusted 10year survival of 99% for a CAC score of 0 compared with 89% for a CAC score >1000. 21 Table 1 summarizes recent published prognostic studies based on CAC scoring. Although the presence of CAC is synonymous with coronary artery atherosclerosis, it does not imply stenosis. The disease process begins decades prior to causing obstruction of blood flow and symptoms. This is best explained by positive remodeling, where in its early stages, plaque accumulation produces a compensatory outward expansion while maintaining a constant luminal diameter. 28 Currently, invasive coronary angiography (ICA) is the reference standard for the detection of coronary artery atherosclerosis in patients with known or suspected CAD. Nearly 4 million ICA procedures are performed annually in the United States for the purpose of detecting CAD. 29 The procedure-related major complication rate for death, AMI, and stroke is <1%. 30 Because of the small but nonnegligible risk of morbidity and mortality, there has been an impetus to develop a noninvasive modality of coronary artery imaging. Furthermore, ICA is limited by its inability to see beyond the vessel lumen. 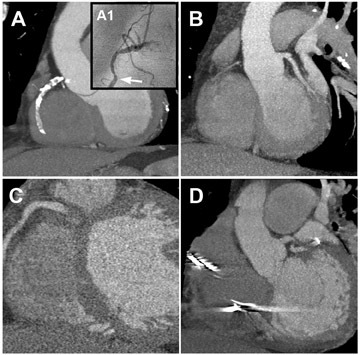 In contrast, coronary CTA allows for the assessment of both luminal stenoses and identification of the extent of the plaque burden through the visualization of the vessel wall (Figure 1). Native coronary arteries- Numerous studies have compared the diagnostic accuracy of detecting coronary artery stenosis by MDCT to ICA. The diagnostic performance of MDCT varies depending on the type of analysis performed-per-segment versus the more clinically relevant per-patient analysis. Many of the early studies performed a per-segment analysis and excluded uninterpretable segments, leading to overestimation of sensitivity and specificity. Comparison of pooled per-segment accuracy with per-patient accuracy reveals an increased sensitivity from 81% to 96% at the expense of a reduced specificity from 93% to 74%. 31 There has been an overall decrease in the number of uninterpretable segments with recent technological advances; however, this still remains a problem. The diagnostic accuracy of MDCT has improved dramatically when moving from 4- to 64-slice MDCT with sensitivities and specificities in interpretable segments approaching 100% in the latter. 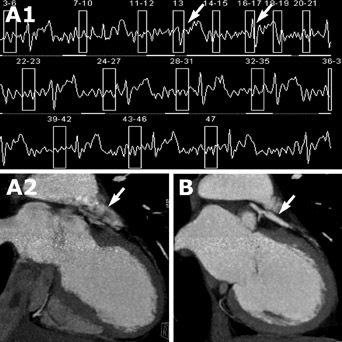 2 Figure 2 shows an example of a patient with flow-limiting CAD seen on coronary CTA and confirmed by ICA. Table 2 shows the diagnostic accuracy for the detection of coronary artery stenosis using 64-slice MDCT angiography compared with ICA from recent published studies. Postrevascularization- In 2004, an estimated 1,471,000 inpatient diagnostic cardiac catheterizations were performed, with roughly 427,000 referred for coronary artery bypass graft (CABG) surgery and 1,285,000 for angioplasty. 1 Patency of bypass grafts and coronary artery stents is limited, thus follow-up examinations are inevitable. Much of the improved accuracy of imaging grafts is due to their larger diameter, minimal calcification, and reduced motion. However, for MDCT to play a significant role in the evaluation of the symptomatic post-CABG patient, a complete angiographic assessment of grafts, nongrafted arteries, and distal runoff arteries is required (Figure 3). 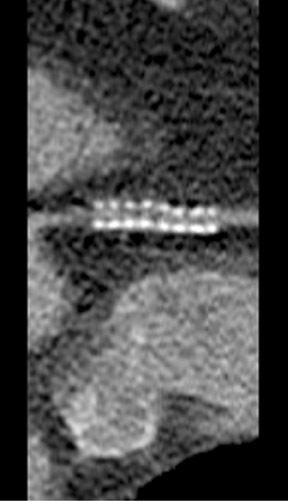 This can prove to be a challenge in cases of advanced atherosclerosis with heavily calcified, diffusely diseased vessels. A limited number of studies have examined the diagnostic accuracy of coexisting native CAD. First reports using 16-slice MDCT showed sensitivities and specificities of 83% and 59% with all segments compared with 100% and 93% with grafts only. 35 Recently, 2 small studies used 64-slice MDCT to evaluate bypass grafts, native (nongrafted) arteries, and distal runoff coronary arteries. The accuracy for detecting graft stenosis was similar to previous reports, but the reported accuracy for native and distal runoff coronary arteries was much worse, with sensitivities and specificities as low as 86% and 76%, respectively. 36,37 Table 3 summarizes the diagnostic accuracy in the detection of stenosis in bypass grafts versus native and distal runoff coronary arteries. The inability to adequately assess native coronary arteries severely limits the clinical utility of coronary CTA in patients after CABG surgery. Acute chest pain- Chest pain accounts for nearly 6 million visits to U.S. emergency departments annually; >50% of patients admitted to the hospital are admitted for noncardiac causes. This results in an enormous economic burden on the healthcare system. Despite conservative approaches, 2% to 10% of cases of acute coronary syndrome (ACS) are misdiagnosed. 44 As a result, there is a movement to efficiently triage patients presenting to the emergency department with chest pain to avoid unnecessary hospital admission while delivering appropriate care to patients with ACS. Multiple observational studies have shown that MDCT is highly accurate in detecting coronary artery stenosis and in predicting ACS in low-to-intermediate risk and high-risk patients presenting to the emergency department with chest pain. 45-48 A small randomized trial comparing MDCT to the standard of care in low-risk patients found that MDCT effectively triaged >75% of the patients either to discharge (68%) or to undergo ICA (8%). 49 Additionally, MDCT has been shown to have similar accuracy to nuclear stress testing in this setting. 45 One advantage of using cardiac CTA over stress imaging in the emergency department is that cardiac CTA can exclude extracardiac causes of chest pain, such as pulmonary embolus or aortic dissection. One small outcome study of individuals with stable angina with a mean follow-up of 16 months has been published. Patients with a normal coronary CTA had a 1-year event rate of 0% compared with 30% in patients with any evidence of CAD on coronary CTA. Additionally, patients with flow-limiting CAD had an event rate of 63% compared with 8% in those with non-flow-limiting CAD. 51 This study further illustrates the importance of not only detecting CAD but also differentiating between flow-limiting and non-flow-limiting disease. The use of coronary CTA in low-to-intermediate risk symptomatic patients would prevent ICA in patients with a normal coronary CTA. In the setting of acute chest pain in the emergency department, patients can be rapidly and effectively triaged in addition to excluding extracardiac causes of chest pain. 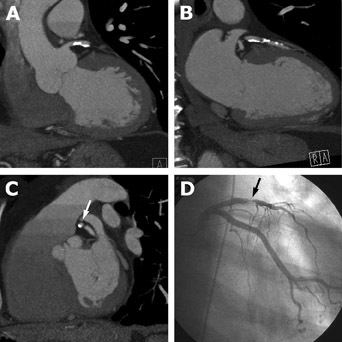 It is conceivable, however, that coronary CTA may result in an increase in the number of unnecessary ICA procedures and subsequent revascularizations. This was seen in a recent study in which more patients in the coronary CTA arm underwent ICA and subsequent revascularization than did those treated with the standard of care. 49 Although requiring further validation, the diagnosis of flow- limiting CAD by coronary CTA may identify patients who warrant intensified risk factor modification and goal-directed medical therapy. Additionally, individuals with flow-limiting CAD by coronary CTA will likely be referred for additional diagnostic testing, possibly ICA with revascularization, especially in the setting of left main coronary artery or multivessel disease. There are limited data that suggest that coronary CTA appears to be a time- and cost-effective strategy in patients presenting with acute chest pain to the emergency room. Coronary CTA has been shown to significantly reduce the median diagnostic time in patients undergoing MDCT angiography (3.4 versus 15 hours) compared with patients treated with the standard of care. Reduced cost is primarily a result of reduced length of stay. 49 Although this study does not show cost-effectiveness, it suggests a potential cost-effective approach if applied across large numbers of patients presenting to emergency departments annually for acute chest pain. Multiple contraindications to performing cardiac CT exist relating to patient safety and potential artifacts. Because of the need for iodinated contrast agents, cardiac CT should be avoided in individuals with intravenous contrast allergies and renal insufficiency. There is a small but non-negligible risk of contrast-induced nephropathy; however, it is associated with high in-hospital morbidity and mortality. 53 Radiation exposure has been linked to malignancy and birth defects. Consequently, women who are pregnant or breastfeeding should not undergo cardiac CT. With the widespread use of cardiac CT for the detection of subclinical coronary artery atherosclerosis, this has become an issue, especially in young women because of the risk of breast cancer. A recent study reported the estimated lifetime risk attributable to a single coronary CTA to be as high as 1 in 143 for a 20-year-old woman. 54 Additionally, obese patients require increased X-ray tube current output for adequate tissue penetration and spatial resolution and thus receive a higher radiation dose. Factors that lead to artifact include arrhythmias (atrial fibrillation or flutter and premature ventricular or arterial contractions), heart rate >65 beats per minute that is refractory to beta-blockade, 55,56 metallic structures (vascular clips, bypass graft anastomosis markers, and metallic valves), dense calcium, coronary artery stents, body mass index (BMI) >40 kg/m 2 , and poor opacification. 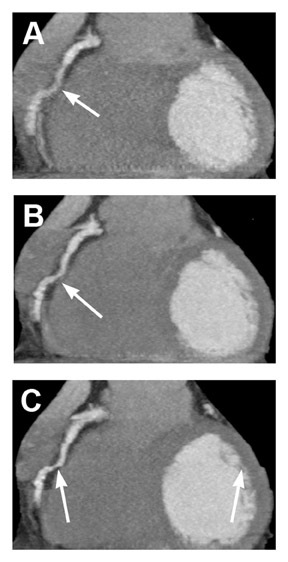 The exact role of cardiac CT has not been fully elucidated, and the guidelines are evolving. A recent scientific statement published by the AHA suggests that there is conflicting evidence and diverging opinions about the usefulness of cardiac CT for the detection of coronary artery atherosclerosis. According to the AHA guidelines, CAC assessment is useful for the detection of subclinical CAD in intermediate-risk asymptomatic individuals. For symptomatic persons, coronary CTA is useful in those with low-to-intermediate pretest likelihood of CAD. 64 Additionally, several imaging societies have collaborated on the 2006 Appropriateness Criteria for Cardiac CT Imaging. 65 According to this consensus statement, the usefulness of CAC measurement is uncertain in asymptomatic individuals. Coronary CTA is considered to be appropriate for the evaluation of both stable angina and acute chest pain in individuals with intermediate pretest probability of CAD. 65 The usefulness of coronary CTA in patients following revascularization is uncertain in symptomatic individuals and is considered to be inappropriate in asymptomatic individuals. 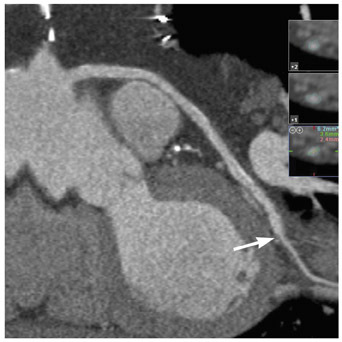 Although promising, cardiac CT still has limitations that prevent a broad clinical application in the detection of coronary artery atherosclerosis. In addition, it is a problem that no large trials have firmly established its clinical utility, cost-effectiveness, or the best way to integrate cardiac CT in the work-up of patients with suspected CAD. Multiple technologic advancements on the horizon (including DSCT, 256slice MDCT, and hybrid imaging with PET-CT or SPECT-CT) will offer the potential for reduced artifacts and for an overall improvement in diagnostic accuracy. On-going randomized trials are evaluating the potential applications of coronary CTA in the evaluation of acute chest pain. The future is bright for cardiac CT as a potential mainstay of noninvasive imaging of coronary arteries. I would like to thank Drs. Pamela Woodard and Robert Gropler for their mentorship and Drs. Santosh Mathews, Suraj Kurup, Michael Barry, Brian Seeck, and Peter Rao for their constructive criticism of the manuscript. Cardiac CT for coronary artery atherosclerosis detection: Potential applications in symptomatic and asymptomatic individuals. Appl Radiol.